Simple Chinese Cooking has become the weeknight go-to book for many of us, much-loved for its fast and fresh-tasting results from readily available ingredients with the minimum of fuss. This long-awaited follow-up is a winning combination of inspiring new recipes and master classes in classic Chinese techniques – a must-have for your kitchen bookshelf. With Kylie at your side in the kitchen, you can easily expand your repertoire by mastering techniques such as tea-smoking and pickling. Learn how to make your own spring rolls, sticky rice parcels and a versatile XO sauce that will transform seafood or vegetable – even simple fried rice – with its layers of flavour and complexity. In It Tastes Better, Kylie Kwong has created over 100 recipes inspired by fresh, seasonal and sustainably produced food, including Salad of Poached Squid with Pickled Cucumber, Dill & Chilli; Red-Braised Lamb Shoulder with Roast Garlic & Tamari Dressing; and an irresistible Pavlova. Travel with Kylie Kwong as she rediscovers her Chinese heritage, exploring the food and culture of a vast and enigmatic country. Her inspiring journey takes her from the rural simplicity of her ancestral village in China’s southwest to the wilds of the Tibetan plateau and the stylish modernity of Hong Kong and Shanghai. Whether searching for the perfect dumpling in Shanghai, exploring the contemporary art scene in Beijing and Hong Kong, rifling through sacks of spices the size of mattresses in Chengdu, or marvelling at the silkiness of freshly made noodles in Xi’an, Kylie is tireless in her quest for new experiences and encounters, cooking up a storm and winning hearts wherever she goes. My China has been named Best Chinese Cuisine Book in the World at the 2008 Gourmand Cookbook Awards; it was also the Australian winner of the Best Culinary Travel Guide category. Cooking Chinese food at home has never been easier – all you need is this book, a wok and a quick trip to the supermarket. 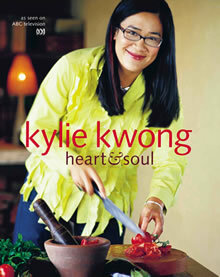 Kylie Kwong’s philosophy is to use the freshest produce and cook it simply to make the most of the clean flavours. All the necessary ingredients are available at your supermarket and Kylie’s recipes are friendly and straightforward. With inspiring photographs of the finished dishes, and step-by-step pictures to guide you through their preparation, Simple Chinese Cooking will never be far from your kitchen. Simple Chinese Cooking won the food photography and styling category at the 2007 IACP cookbook awards. 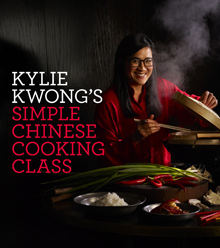 In Heart and Soul, which accompanied her first television series, Kylie Kwong shares the recipes for the dishes she most loves to cook – whether for a simple supper of Hokkien noodles, a family celebration in her own home or a stylish cocktail party. With the emphasis on intense flavours and the freshest and finest produce, she creates mouth-watering dishes out of inspired combinations of Western ingredients and Eastern techniques. From a fresh take on Chinese-restaurant classics to treasured family favourites, this is food to be relished. Heart and Soul was highly commended in the best hard-cover recipe book category at the 2004 food media awards. In a celebration of cultural and culinary inspirations, Kylie Kwong presents her recipes for the fresh and approachable Chinese food served at her Sydney restaurant, Billy Kwong. Intertwined with the recipes are affectionate portraits of memorable meals – from cooking fried rice for her grandmother’s boisterous mah-jong sessions to the everyday ritual of shopping in Chinatown. This captivating book is a very personal, intimate journey in the company of a fascinating family and the food that binds them together. Recipes and Stories won the best soft-cover food-related book at the 2004 food media awards. If you’re in Australia, please click here to find out where you can purchase Kylie's books. Otherwise, please click here to order.